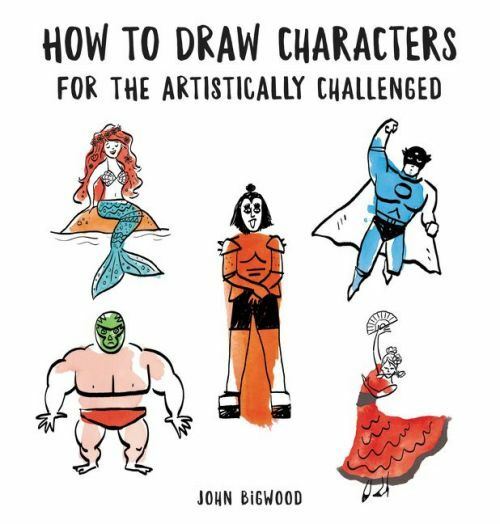 How to Draw Characters for the Artistically Challenged is a new how-to and art book from author, illustrator, and graphic designer, John Bigwood. It a book for budding artists who can hone their skills and learn to draw character portraits in an original interactive guide. Do you love to create art, but feel a little unsure about your skills? Well, there is a small art book that can help you master the ability to draw all kinds of people and faces. How to Draw Characters for the Artistically Challenged includes 46 different looks to sketch. Each entry is a drawing guide and is a two-page spread. The right-hand side features a painted watercolor outline of a face or body. On the left side of the spread is a corresponding page of suggested facial and body features, limbs, hairdos, clothes, and adornments that a budding artist can use to finish creating the painted outline of a face or body on the opposite page. 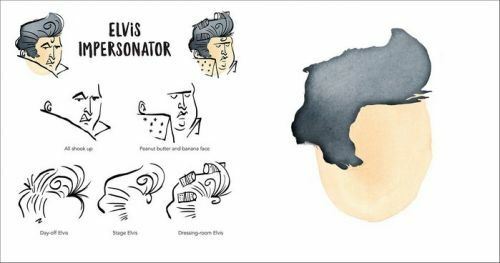 Elvis Presley template from "How to Draw Characters for the Artistically Challenged"
THE LOWDOWN: A publicity agent for Harper Design sent me a copy of How to Draw Characters for the Artistically Challenged for review. At first, I was put off by this book, but as I flipped through it, I became really impressed by what it offered. Honestly, I think How to Draw Characters for the Artistically Challenged will work for artists who are already drawing or is comfortable with tracing. You don't have to be a master, but you should at least be able to draw basic cartoon shapes and objects and also be able to cartoon the human figure and face at a minimal level. 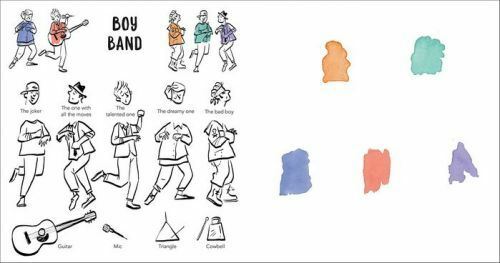 "Boy Band" template from "How to Draw Characters for the Artistically Challenged"
I think that people who like to draw cartoons and use how-to-draw books will find a lot to like about this book, even if it is just to appreciate the off-beat and quirky drawings in this book. How to Draw Characters for the Artistically Challenged is fun and accessible and different. And I can't stop thumbing through it. I READS YOU RECOMMENDS: I think youngsters who like to draw and anyone looking for a wacky how-to-draw book will like How to Draw Characters for the Artistically Challenged.